About 5,500 years ago, an underground gallery was constructed in the region by the Agathyrsi. In February 2012, a group of geologists followed the gold vein in the same place. They kept digging until they ended up at the base of the gallery. To their utter surprise, they found a gravestone which was definitely not made of common rock. The geologists took a sample, and the laboratory results revealed that the components of the tombstone included 55% 50 karat gold dust, 15% granite dust and 30% wolfram. Also, the analysis revealed that the composite rock had been made using a type of technology unknown today. Known by the name of “The Hyperborean Gallery” or “Gallery 13”, the place of this amazing discovery is located beneath Cornea village. A number of other discoveries were made at the site in 1976. However, in the name of “security” the anthropological and archaeological discoveries were deemed too unusual and shocking for the time, so the gallery was permanently sealed. The gravestone was not the only unusual item found inside the gallery. On it, archaeologists found a 10 meter (32.8 ft.) tall skeleton of a giant. Apparently, the giant had been buried there after his death, with his legs gathered on one side. Lacking the proper equipment necessary to analyze such a find, the skeleton was sent to Moscow. Unfortunately, nothing has been reported about the giant ever since. As for the tombstone, a new series of research was planned to analyze it in 2012. The relic was dug up once again and measurements showed that it was six meters (19.7 feet) wide, twelve meters (39.4 feet) long and three meters (9.8 feet) tall. It weighed almost 1700 tons and contained somewhere around 900 tons of solid gold. To make a comparison, such a quantity of gold would have required over twenty years of mining work to gather. The last thing known about the gravestone is that it had been cut up into 80 smaller pieces in order to make its transportation possible. As for its destination, it is not known where it lies today. One of the archaeologists working in Gallery 13 took a set of photos with the gravestone and sent them to a paleolinguist. The latter noticed emerald green bas-relief writing covering the entire surface of the artifact. The text had been written in three parallel rows which started in the upper left. From there, the writing descended diagonally, similar to a serpent, and formed a spiral around a wolf head. Finally, the script ended in the lower right corner. The paleolinguist speculated that the unknown writing could be Pelasgian and that the discovery with its markings and writing clearly possessed great cultural and historical value. Nevertheless, the gravestone was cut and melted. The state obtained a share of 19 pieces, 31%, as stipulated in the local gold exploitation contract. During the excavation, the lifting of the gravestone also revealed the entrance to a pit. The four meter (13.1 feet) diameter pit had a descending spiral stairway and a milky violet light radiated from the inside. A closer inspection of the stairs made it clear that they looked as if cut into the walls of the pit by a laser and, as for the violet light, nobody could determine its source. Curious to find the source of the light and to see what was inside, the paleolinguist descended into the pit, but nobody else proved brave enough to join him. The night passed and the man never returned from the pit. Ultimately, the army sealed the entry to the pit, as well as the entire Gallery 13, with cement. Those present never talked about the discoveries again - as they had been made to sign confidentiality agreements, therefore what lies beyond the staircase of the pit remains a mystery. Depending on the region of Romania where the legends come from, there are different names for giants. In the Boziorul area, giants are known as “tartars” (“tartari”), for example. 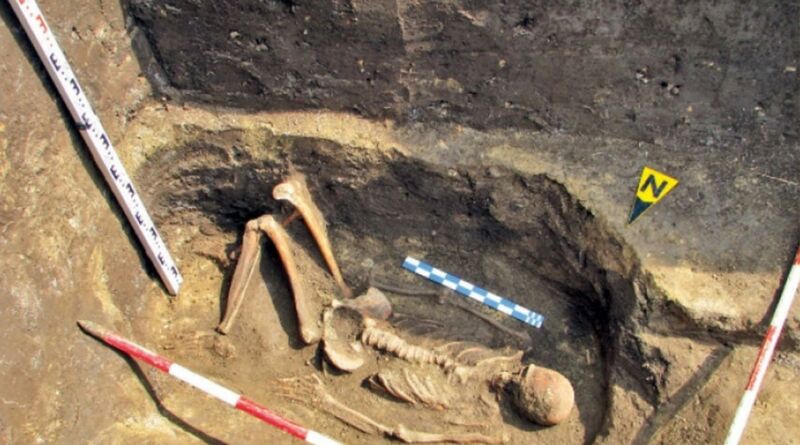 A number of unusually tall skeletons have been uncovered at Scaieni, in Buzaului Mountains. For instance, when locals tried to plant apple trees on a hill, they accidentally discovered humanoid skeletons of over 2.4 meters (8.2 feet) tall along with pottery fragments. Knowing the local legends, people from the area immediately thought about the tartars. One of these legends even claims that the mountain formation known as the “Pillars of Tainita” (“Stalpii Tainitei”) had actually been built by these giants of old. In the past, the giants were also credited for building two large underground halls somewhere beneath the mountain. The strange formation which can be seen up on Tainita Mountain resembles a set of stone chairs. As they are found at high altitude and in a highly inaccessible area, locals claim that tartars built the chairs to sit on when they wanted to gather for council. Another legend from Hateg Country (“Tara Hategului”), tells the tale of two giantesses who built two cities: one in Deva and the other on the peak of the Severed Mountain (“Muntele Retezat”) respectively. Upon the end of the construction, when the giantess from Deva beheld her rival’s city and saw it had turned out more beautiful, she became envious. In a moment of rage, she threw a plough towards the mountain citadel - destroying it and severing the top of the mountain at the same time. In this way, the mountain earned its name, being known ever since as the Severed Mountain. In regions such as Teleorman, Giurgiu, and southern Muntenia, giants are known as “jidovs” (“jidovi”). A local legend speaks about a hero going by the name of Novac who fought a jidov. Once the giant was defeated, he ran away to save his life, but in his flight he left a mark on the ground. 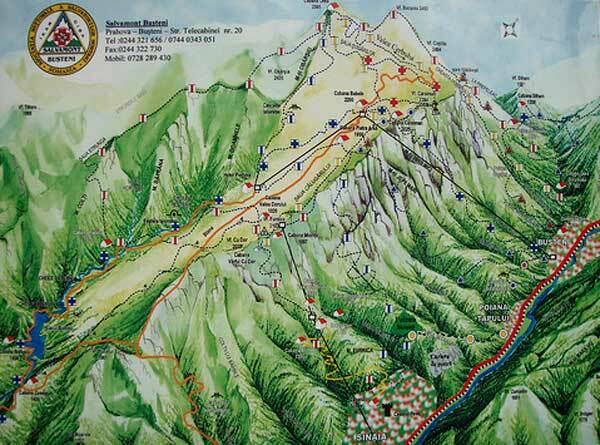 The area has been called “Brazda lui Novac” ever since. In the region there are also other formations called “maguri” by locals who believe that these have been built by giants. A number of archaeological discoveries have been made in Giurgiu. For example, it was found that in Argedava, King Burebista had his first city (before he unified the Dacian tribes of the area). Yet, an even more interesting discovery was made between the years 1940 and 1950. In this period, archaeologists unearthed 80 humanoid skeletons which appeared to be giants. The huge skeletons measured about four to five meters (13-16 feet) in height. Giant skeletons have been unearthed in other parts of the country as well. As one example, in October 1989, 20 giant skeletons were found in Pantelimon – Lebada. Other such discoveries have been unearthed at Polovragi, at Cetateni, beneath Negru Voda Monastery, and in the Bucegi Mountains - where the existence of a network of underground tunnels surprised workers. Thus, skeletons of giants have been discovered in many places around Romania. To get straight to the point, giants have been discovered in: Scaieni in Buzau County, Mariuta in Calarasi County, Persani Mountains, Polovragi, Piatra Craiului, Tara Hategului, Cetateni beneath Negru Voda Monastery, and in many other places. In Maramures, the Fortress of Oncesti (“Cetatea de la Oncesti”) was believed to be the home of the giants. At Argedava, giants with a height of over five meters (16 feet) have been discovered in 80 graves. Although most are suddenly “lost” after being discovered, the secret Romanian giants continue to be unearthed. You know, I come to this site because it is one of the few sites that approaches Archaeology in a professional manner. But between Giants and Anti-matter Entities I think it's time I moved on. I'd go to Message from Eagle if I wanted woo. Jack, I can understand that you might be put off on this topic, but there are plenty of other things on this site to read about. No one is forcing you to read, or believe in this particular subject. That being said, there are too many stories, accounts and/or pictures from the past that point to this being factual. As the saying goes, 'History is made by those who have conquered. There seems to be a concerted effort to keep evidence of this from the publics eye. This, coupled with the lack of interest by the masses, makes it far easier to cover up, and never come to light. Then, when you only see it come out on the History channel as a show, or on here in articles, it becomes much less credible. It is either the Museum of Natural History or the Smithsonian, (I cannot remember which) who have had the bones, and they have mysteriously disappeared. Scientists have come forward in the past, and have said as much. I am not saying that there isn't a chance this is a false or faked story, but there is too much evidence to dismiss it completely. the answer is simple . read the biblical account,genesis 6,4.this started long ago.why does the smithsonian want to cover it up or deny them because that would mess up there evolution millions of years theory and you believe you came from a monkey. Once you bring the bible or any mention of the sky fairy into the conversation it negates your argument, now I have a question for you,which do you think is more likely that we evolved from the apes or the sky fairy made us??? ?